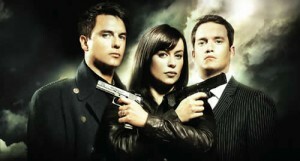 Shortly after the finale of Torchwood: Children of Earth, creator Russel T. Davies announced that he had a fourth season ready to go if that’s what people wanted. YES IT’S WHAT WE WANT! (sorry for shouting, I’m very passionate about Torchwood). We were told on 12 November 2009 by RTD that Series 4 had been confirmed and production should start in January 2010 in a collaboration between BBC and Fox, in a format targeted for a US audience. John Barrowman confirmed that he had signed up for 13 episodes. Doctor Who writer Andrew Cartmel had been confirmed as writing an episode for season 4 titled “The Jinx”. January 2010 has come and gone, with no word on any progress. As the calendar continues to tick over, I’m starting to worry that things are not well in the land of blowfish in convertibles. April 11 2010, John Barrowman is reported to have said in an interview on Heat Radio that season 4 is still in discussions, and time will tell if it is put into production. April 22 2010, BBC Worldwide & Fox announce that they will not be collaborating on a joint production of Torchwood. Apparantly BBC Worldwide is in talks with other networks about a possible collaboration. In relation to a US version of Torchwood, executive vp of BBC Worldwide, Jane Tranter, has been quoted as saying “It’s very much ongoing and very much alive”. Is there ever going to be a season 4 of Torchwood? Is Torchwood Cardiff truly dead and burried? Is the next installment in the Torchwood franchise going to be Torchwood: <<insert US city name here>>? Can someone fill me in? I’m sure as hell confused and disillusioned. Torchwood: The Complete First Season on DVD and Blu-ray , Torchwood: The Complete Second Season DVD or Blu-ray and Torchwood: Children of Earth DVD or Blu-ray from Amazon. 🙂 What I don’t understand is why the BBC is mucking us around with this. They’ve seen how popular its become. Starting on BBC3 working its way up to the premium channel BBC1. The world wide response to Children of Earth was nothing short of outstanding. BBC is smarter than that, aren’t they? Syfy is owned by NBC. So that could be a good marriage. NBC seem to give programs a red hot go. You’re probably right about TWC. Owen… gone (not too cut up about that), Toshiko… gone, Ianto… gone, the Hub… gone. I’m wondering if maybe Alonso (End of Time Pt2) is to be a member of the new Torchwood? Why did The Doctor introduce Jack to him? It’s not as if Jack’s had problems pulling in the past. I’m sure it’ll be revived – BBC won’t want to let go of something so popular. If the US networks don’t sort it out, then perhaps they’ll move S4 back to Brit shores. I’m personally really interested in finding out more about Torchwood 2 (in Scotland, I’m guessing in Torchwood House, from Tooth and Claw…).